Looking for something new to try in Canberra, I came across a one off painting session on Groupon and thought I’d give it a go. The testimonials on the Paint It Up website are along the lines of: “I didn’t think I could paint and I was amazed at my painting at the end of the night”. So I thought maybe there is a formula to paint and perhaps I could do it too. I went to one of the sessions held at The Duxton in O’Connor. The session is held upstairs in the cosy loft area and there’s space for about 20 people. The topic of the night was “Rainy Canberra Night”. Up the front of the room is the painting you are about to (hopefully) create or at least something similar. So with a wine and paintbrush in hand I sat in front of my easel – albeit a little daunted by the blank canvas staring back at me. The instructor was former kindergarten teacher Joy Webber. Her introductory spiel told the room that children never have any concerns that they can’t paint, they just go on and do it, but as adults we often have this sense that we can’t do something, even if we haven’t tried it before, or not for a few years. It’s a valid point. The paintbrushes were known as Goldilocks, which is not as silly as it sounds. There’s a Papa Bear, Mama Bear, Teenager and Baby Bear brush which Joy helps you identify at the start of the session. Each time you need to change brushes, Joy calls out the Papa Bear or Teenager for example and it is helpful to identify which one you need. 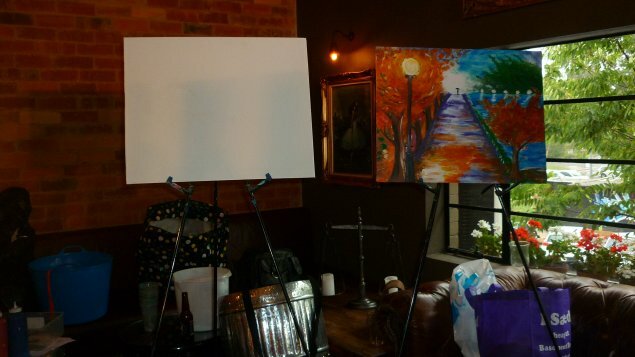 The session takes you step by step through the painting. 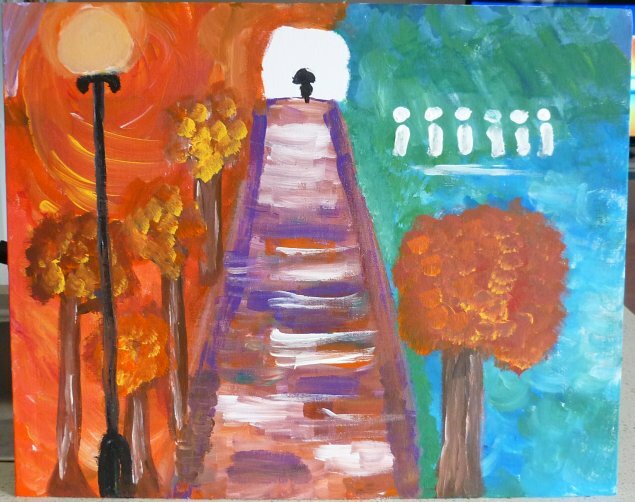 First we started on the path, then the clouds, and then the trees finishing up with the street light. Joy is there to help you through each step and make any necessary corrections. The first couple of hours flew by as I became so engrossed in painting and trying my best to do each part right, and it was interesting and fun to try something different. I was surprised that my picture came out resembling what we were supposed to paint – although I guess that could be open to interpretation. But for someone who hasn’t painted since I was a kid, I was pretty impressed with my effort. Looking around the room, everyone had a different take on the image, injecting their own personality through the use of colour and brushstrokes. There were some that looked fantastic and ten times better than mine, but I think possibly once you know the formula and do some practice you will improve over time and get a better grasp on brushstrokes, how much paint to put on your brush, and mixing colours for example – as well as patience to take your time on each section. 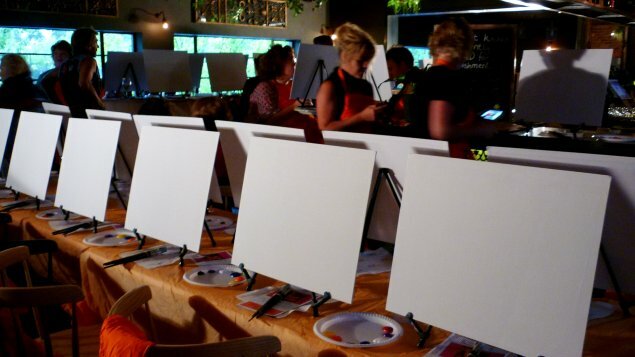 The canvas, paint, paintbrushes, easel and apron are all supplied so you don’t need to bring anything except yourself and maybe a few friends to give it a try with you. For more information and dates of upcoming events, go to www.paintitup.com.au. Sessions at held at The Duxton in O’Connor or Digress Cocktail Bar in Civic. The cost on the website is $65 but I’ve seen these sessions promoted a few times on Groupon or Living Social which brings the cost down to $30. I’m giving that as a Birthday treat to my friend.